Solstice is back again this summer with a new venue and a new attitude. 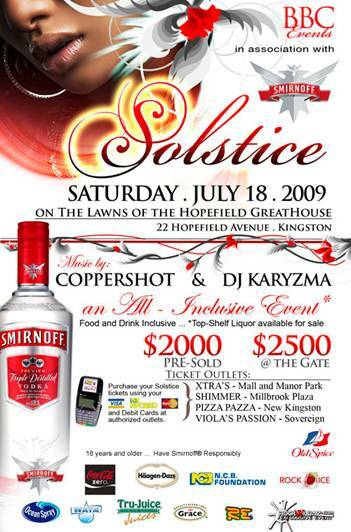 The party that has never failed to give you the ultimate party experience will take place on Saturday July 18, 2009 at the Hope Field Great House in Kingston. Solstice is a bi-annual all-inclusive party that allows the patrons to eat, drink and dance to their hearts content, and this year will be no different. Now in its second year, the event is produced by BBC Events, headed by twin brothers Horace and Howard Britton. According to Horace, the new venue gives BBC Events more room to create that premium Ã¢â‚¬ËœwowÃ¢â‚¬â„¢ factor. But how can Solstice compete with other long-established events? Well, the Britton Brothers say that they cater to Ã¢â‚¬Å“individuals and patronsÃ¢â‚¬Â. They are challenging partygoers to imagine an all-inclusive event that will ensure that they get value for their money. Good food, liquor mixed your way and music that will ensure that you receive an individual experience like no other. Ã¢â‚¬Å“It will be all about you the patron as we take you over the edge like no other event has ever done. No matter how high your standards, Solstice will make sure you are pleased at the end of the night, and will have you talking to no end,Ã¢â‚¬Â explained Horace. Now with a larger venue in place, patrons can rest assured that they will have their own space to do whatever they want, as they dance the night away with friends or if they prefer to be reclusive and be with that special someone.